By Glen Anglin: Now that Saturday’s Marquez-Pacquiao is over and the result was another razor-thin decision, the crybabies come out of the woodwork. The standard dolts who consistently pollute this site with their Pacquiao fear/jealousy/hatred have already weighed in with their ‘we wuz robbed’ friggin nonsense. Let’s start with some facts: This fight (just like the previous 2) was excruciatingly closely fought. Neither guy dominated. Both guys deserved to win as much as lose. Those are facts. Anybody who thinks that they saw a clear advantage for EITHER fighter is seeing a mirage. For the record, I publicly predicted a Marquez win in this fight. I thought JMM would use his counterpunching ability to outpunch Pacquiao this time. And, at times he did just that. At other times, he was banged by Pacquiao’s more powerful punches. The main reason that JMM was unable to hurt Manny in this fight is that Pacquiao changed his strategy for this fight. For much of the time, Manny did not wildly wade into Marquez. Instead, he often stood outside and feinted and waited. In other words, he fought like Marquez. Of course, this also means that Manny landed fewer telling punches than in the previous two fights. I was disappointed that both guys did not throw more punches; try more, be more aggressive. I think that if Juan would have put a little more pressure on Pacquiao, he would have landed some more telling punches. But that is just wishful thinking. The fact is, he wasn’t more aggressive, and he did a lot of standing and waiting, which is generally not the way to take away the other guy’s title belt. All that said, a good case can be made that Juan won the fight. Just as a case can be made that he lost it. It was just too close to be an obvious victory for either guy. 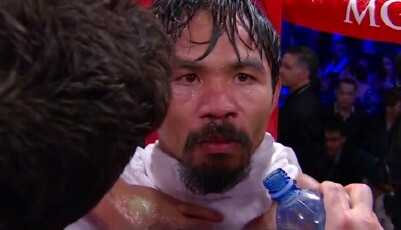 In the end, it looked like Juan ‘out generaled’ Manny and made him fight a different fight, but that Manny outpunched Juan more often than not. The only thing that was ‘exposed’ about Pacquiao is that he can be fought to a photo finish by an all-time great boxing technician and counter puncher exactly his size, which was also shown to be the case in their previous two fights. So, what’s new? So, all you silly, deluded jackasses braying about how Marquez was robbed of an obvious win or that Pacquiao dominated just stop; you look and sound like children throwing a tantrum. You can say that in your opinion that your guy won, and that’s fine. But any gibberish about being robbed or an obvious win for either guy needs to be written in your personal teenage diary, where the adults aren’t exposed to it.